1Excavation in the fifth and final campaign focused on completing the exploration of the compartments and structures that had been started in the previous campaigns1. At the end of the 2011 campaign, however, some structures remained incompletely excavated because of the appearance of unsuspected earlier levels and because some structures turned out to be larger than expected. 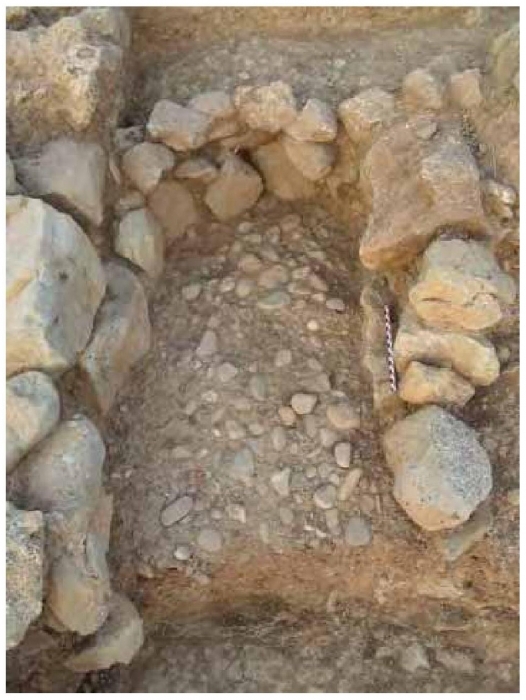 After five years of excavation it is certain that all the tombs so far tested at Sissi are rectangular house-tombs, a type of tomb that is frequent in East Crete in the Early and the Middle Bronze Age (e.g. Mochlos, Pseira, Palaikastro, Petras; cfr. Soles 1992; Schoep forthcoming). The lower western and northern slopes were used for burial structures and the house-tomb (9.1-9.4) on the west slope, immediately east of the Neopalatial houses in Zone 2, has proved to be more substantial than expected (fig. 2.1 A & B). Depositional activity in the cemetery can be dated between EM I/II A and MM IIB2 and so far there is no evidence for later activities, funerary or otherwise. As was the case in previous reports, the following discussion of the compartments will be structured according to the terrace on which they were found. 2Spaces 1.17, 1.18 and 1.29 are situated on the upper terrace of the north-east slope in the south part of the cemetery. To the south of 1.29 and 1.18 there is bedrock and this area seems to have functioned as open space, within which some pottery (cups, juglets) was deposited. 3Compartment 1.17 to the south of the EM IIA tomb 1.11-1.12 has revealed a complex stratigraphy that testifies to intensive use of this area in MM I-IIA. The latest phase of funerary activity in 1.17 is represented by the construction of a rectangular compartment with two slightly curved walls and a floor of large pebbles (fig. 2.2), part of which had already been excavated in 2009. This feature was constructed in the eastern part of 1.17 over a horizontally placed pithos that contained the remains of a woman of advanced age (Sissi II: 48, fig. 3.7), crushing the pithos in the process (Sissi II: 50, figs 3.10a & b). 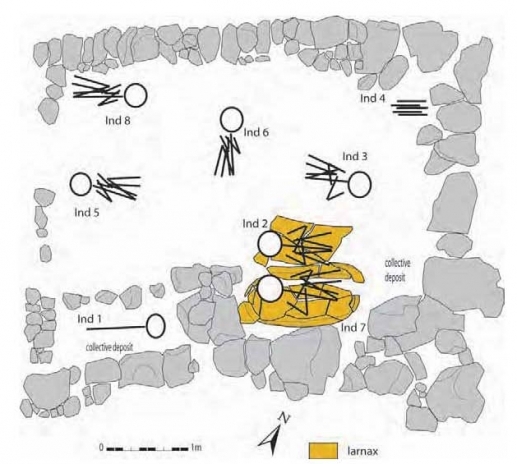 The 2011 campaign revealed the southern half of the compartment and confirmed the stratigraphy encountered in 2009: there were two burial levels each containing the remains of one individual. The bones found directly on the floor of large pebbles were better preserved than the remains of the second individual found higher up. Although showing some anatomical connections the remains on both levels had been disturbed after decomposition. 4In 2009 below the horizontally placed pithos an earlier burial level had been identified, which continued underneath the floor of large pebbles (Sissi II: 50). It contained a multiple burial of two superimposed individuals who were buried facing each other and at the same time (fig. 2.3). One of them could be identified as a woman. This earlier level could not be completely excavated because it continued southwards where it disappeared underneath the double east-west running south wall of 1.17. Since some foot bones were found in the area of the coxal bone, it is clear that the multiple burial had been disturbed after the decomposition of the bodies. It is likely that these disturbances as well as the absence of the lower body of the two individuals took place when the overlying pithos containing the mature woman was installed (see supra and Sissi II: 50). 5The northern limit of 1.29 is formed by the south wall of 1.17 and its southern limit may originally have been formed by a wall constructed on top of the bedrock that has since all but eroded away (Sissi II: 51). 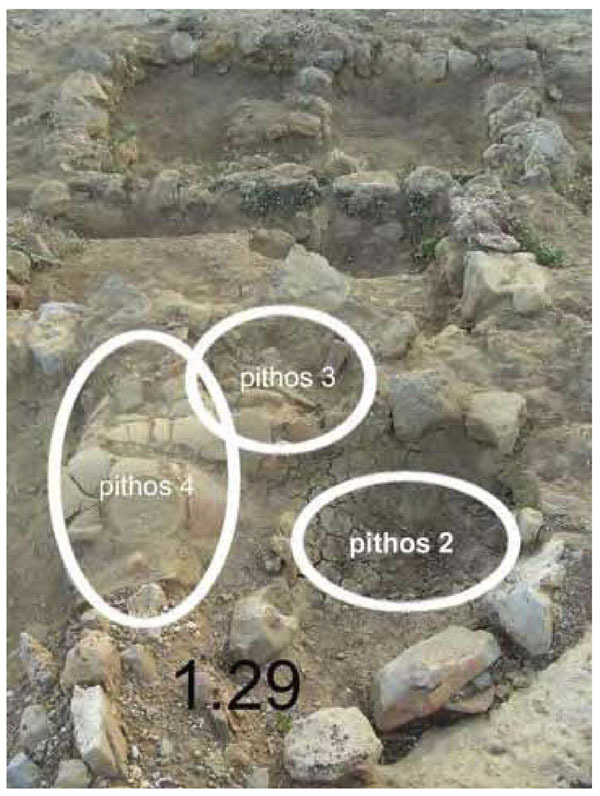 The 2010 excavation of space 1.29 revealed three pithoi (fig. 2.4), one of which was lying against the south face of the south wall of 1.17 and thus post-dates the wall and the floor of small pebbles upon which it was sitting (Sissi II: 51, fig. 3.11)3. Pithos 2 was excavated in 2010 (Sissi II: 51), while pithoi 3 and 4 were excavated in 2011. Pithos 3, the opening of which was oriented east, contained the primary burial of an individual of undetermined age, perhaps an adolescent. The bones were badly preserved and the skull and mandible are missing. The body was placed head first into the pithos head and the hyper-contracted position of the lower body seems to suggest that the legs were bound together or contained in a perishable container upon their placement in the pithos (fig. 2.5). A wheel-made MM IIA juglet was found beneath pithos 3, which itself was placed on top of a pebble floor. 6Pithos 4 (fig. 2.4) was in fact not a complete pithos but fragments of different storage vases that were positioned so that they covered the bodies of at least two individuals. A pithos base was placed against the collar of the pithos to close off the opening and cover a skull. Both individuals were partially preserved. The lowest one, of which only the upper body was preserved, was put on top of a pebble floor on its left side with its head facing east. An obsidian blade was placed in the left orbit of the skull. The individual found higher up was separated from the lower one by a fine layer of sediment and was also partially preserved (humerus, tibia, fibula and a fragment of mandible). 7It is possible to reconstruct the chronological relationship between the three ‘pithoi’ in space 1.29 on the basis of stratigraphical observations (fig. 2.5). Pithos 2, which contained the remains of a MNI of 4, was the first to be placed in this area. Upon the burial of a new individual, remains of the previous burial were taken out and deposited to the east side of the pithos over the east wall of space 1.29 (see the position of the long bones in Sissi II: fig. 3.12). This suggests that the latter wall was no longer functioning as a wall by then and that this space was probably open-air. The next event is the placement of the two bodies that were covered by the fragments that have been called ‘pithos’ 4, which clearly predate pithos 3 since one of the stones supporting the latter was placed on top of the higher individual covered by ‘pithos’ 4 (fig. 2.5). The absence of the lower body of the lower individual in pithos 4 may be connected to the disturbance caused by the installation of pithos 3. 8A horizontally placed pithos was found on a pebble floor in 1.18 (fig. 2.6). It was found beneath an extensive MM IIA dump of mainly pottery but also stone vase fragments, obsidian blades and loose bones. 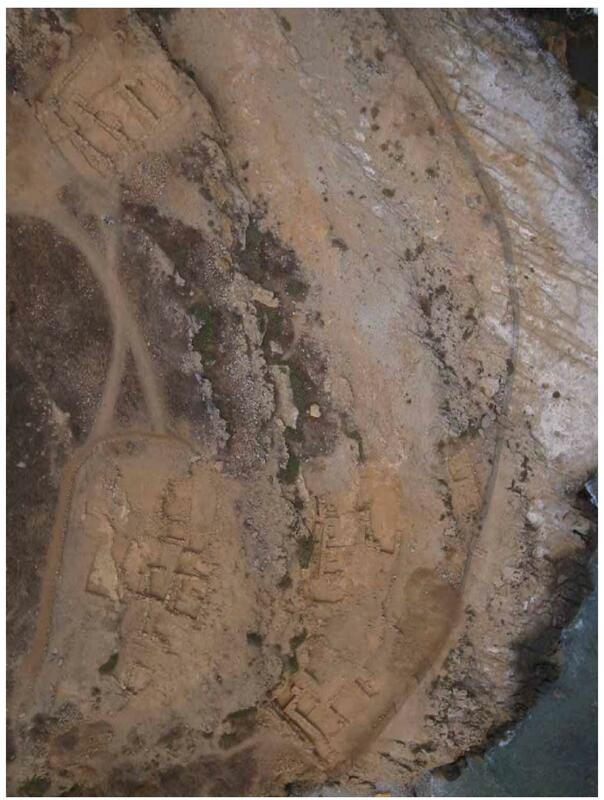 This dump appears to have been laid out over an area covering 1.18-north and 1.18-south as well as the west part of 1.29 and perhaps even part of 1.11-1.12 and 1.18. Upon excavation it became clear that the ‘pithos’ was made up of halves belonging to two different storage vases (2011-1-9500-OB001 pithos 1 and 2011-1-9531-OB001 pithos 2). While the opening of the top half (pithos 1) was oriented west, that of the lower half (pithos 2) was oriented east (fig. 2.7). 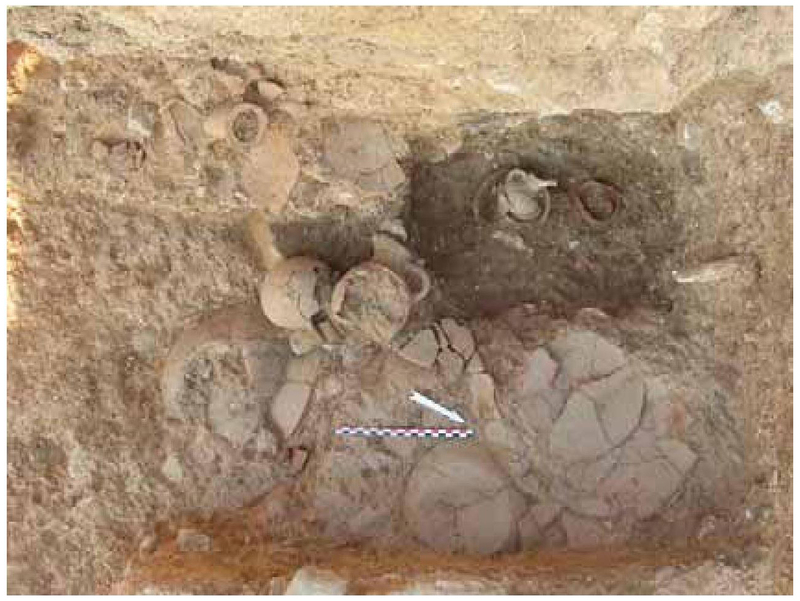 In addition, fragments of additional storage vases and the base of pithos 2 were used to cover the remains that were not covered by the top half of pithos 1. Like all the other pithos burials, the lower half of the pithos was supported by a semi-circle of stones. The remains belong to an adult placed in a hyper contracted position, suggesting that the legs had been bound together (fig. 2.8). 9In the south part of 1.18, beneath the level of the pebble surface on which the above described pithos burial was placed, another pithos burial containing a child was found (fig. 2.9). 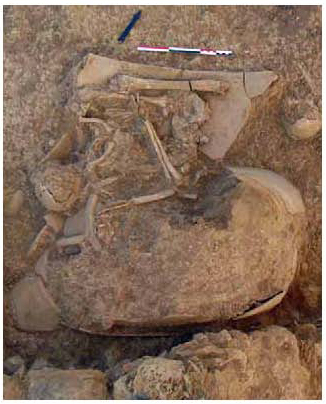 The vase fragments covering the remains also belong to multiple, different containers (2011-1-9675-0B002; 2011-1-9685-OB001) and the largest had clearly cut through the skull of the child underneath. On the basis of its dental development the child can be placed in class [1-4]/[5-9]. The position of the bones suggests that the body decomposed in an empty space. 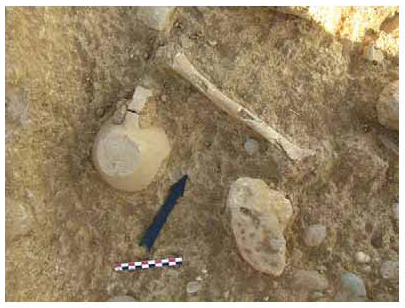 An inverted cup was placed on top of the deposit and a possible stone tool (2011-1-9710-OB003) was found between the right femur and the left fibula. This pithos burial was placed over what appears to be an earlier wall and postdates the pebble floor on which the pithos immediately to the south was lying (figs 2.6 & 2.10). This earlier wall appears to form the western limit of the EM IIA tomb 1.11-1.12. 10After completion of the excavation of 1.18, it seems that it was probably an outside space to the west of EM IIA tomb 1.11-1.12. The child burial in 1.18 south (fig. 2.9) post-dates the west wall of 1.11 but predates the structure to the west (1.20, 1.23), which was sitting on a higher level of pebbles. Since MM IB/IIA material was found (#2011-1-9666) right down to bedrock in 1.18, interspersed with several layers of pebbles, it is clear that most activity dates to this period. 2. Middle terrace (Zone 1): soundings in 1.1, 1.2 and space to south of 1.1-1.2. 11In order to clarify the chronology of the tombs on the middle terrace, soundings were undertaken in rooms 1.1, 1.2, and the space between the south wall of 1.1-1.2 and the outcrop of bedrock further south. Previous excavations in the southern half of compartment 1.2 brought to light a MM II pithos burial and a burial level with the remains of at least two individuals (Sissi I: 47-49, 71-73) situated ca. 0,10 m above a pebble floor. The 2011 sounding in the northern part of 1.2 brought to light an earlier east-west wall that has a slightly different orientation to the later north wall of 1.2 and was constructed in a different technique using very small to small-sized stones (fig. 2.11). To the north of this wall and associated with it was a pebble floor, on which was sitting an inverted, hand-made straight-sided cup (EM III/MM IA) containing charcoal fragments. About 0.10 m above this cup were the remains of a primary burial comprising one individual who had clearly been splintered by the construction of the later north wall of 1.2, the construction of which post-dates this level. The earlier wall made of small stones can be identified as the south wall of 1.13. This is suggested by the fact that the pebble floor in the northern part of 1.2. slopes down to the north and corresponds to the pebble floor found in 1.13. In addition, the remains of four individuals (three adults and a child) in 1.13 were also found about 0.10 m above the pebble floor. This would imply that the individual that had been cut by the later wall of 1.2. actually formed part of compartment 1.13, bringing the MNI in the latter to five (Sissi II: fig. 3.19). The lack of human remains on the pebble floor could suggest that the compartment had been emptied (with the exception of the single inverted cup found sitting on the floor) and was reused for burial at a later date (to be established by detailed study of the pottery). This area was substantially reorganised between EM III/MM IA and MM IIB. 12The EM III/MM IA date for the earlier pebble floor and wall found in the sounding in the north part of 1.2 corresponds to the preliminary date established for compartment 1.3, which seems to form part of the same structure as 1.2 (Sissi I: 47-49). An earlier (EM III/MM IA) level was also encountered between the outcrop of bedrock to the south of the southern wall of 1.2-1.3 (fig. 2.12). On top of a pebble floor and underneath the overhanging bedrock were found a triton shell, a handmade carinated teapot and two handmade straight-sided cups (fig. 2.12). This suggests that in EM III/MM IA the tomb ran all the way up to the outcrop of bedrock, which would have functioned as the (lower part of the) south wall of the structure (cf. Gournia Tomb III, cf. Soles 1992: 28). Since the southern wall of 1.2-1.3 is not sitting on the pebble floor, it would appear to post-date it and may belong to the same period of reorganisation as the northern wall of 1.2. 13A sounding in compartment 1.3 revealed that the deposit of 11 EM III/MM IA cups was sitting on a level of sediment that had accumulated over an earlier pebble floor (Sissi I: 49). Underneath the pebble floor a fill layer containing numerous small stones and sherds, some of which are EM II and some possibly even EM I in date, was laid out to level the bedrock. The EM I sherds are the earliest recovered in the cemetery so far, but no associated architectural remains were identified and the nature of the activity which they represent remains unclear. 14The excavation of compartments 1.15-1.16 to the east of 1.7 and 1.30 and 1.31 was started in previous campaigns (Sissi I: 51-52; Sissi II: 58-60). Excavation in 2011 revealed that 1.16 formed part of a larger structure that incorporated compartments 1.7, 1.8 and 1.31. The previously identified compartment 1.15 turned out not to be a compartment after all but a narrow open space between a large terrace wall to the east and a large structure incorporating 1.7, 1.8 and an unexcavated compartment (fig. 2.13). The northern wall of this large structure has eroded away and the southern wall of 1.16 constitutes its southern limit. Space 1.30 appears to have also been an open space delimited to the south by rock outcrops, under which large quantities of tableware were deposited. 15Two main episodes of deposition could be identified in this area: one in MM II (A?) 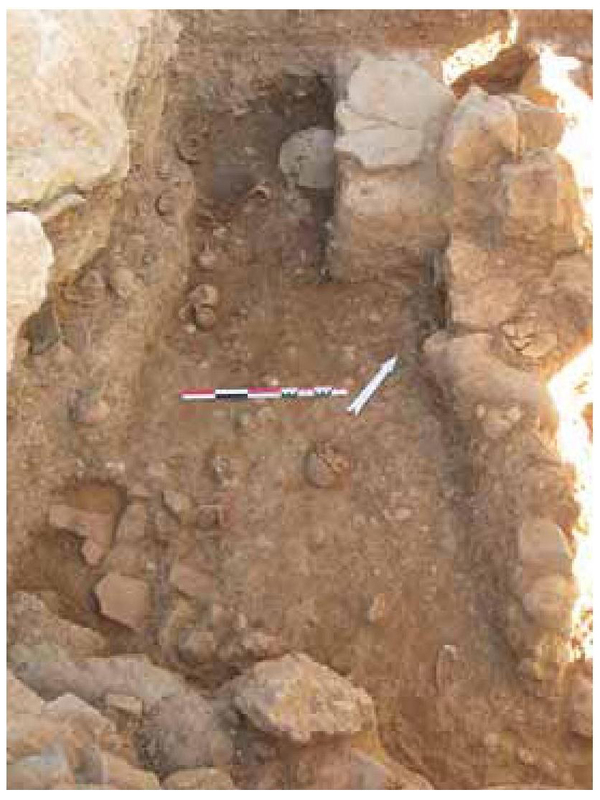 comprising large amounts of pottery, mainly tableware, stones, human and animal bones and fragments of burnt mudbrick (Sissi II: 60) and an earlier one, provisionally dated in EM III/MM IA and comprising large amounts of tableware placed in the space between the southern edge of 1.16 and the overhanging bedrock. This lower level yielded large quantities of charcoal but almost no human bones. 16Following the completion of the 2011 campaign it is now clear that the eastern wall of what hitherto has been termed ‘compartment 1.15’ (Sissi II: 58) runs as far as the rock outcrops that delimit the lower terrace to the south. 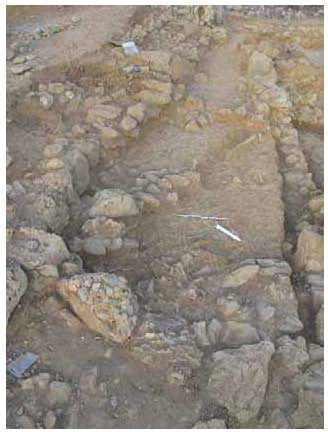 This wall, preserved over a length of 5.80 m and consisting of large-and medium-sized blocks resting on a lower course of large, roughly squared stones, now appears to be a retaining wall or terrace wall rather than the east wall of compartment 1.15 as previously assumed (Sissi II: 58). Consequently, 1.15 should be redefined as a narrow open space between this terrace wall and the east wall of 1.16. Owing to the fact that the terrace wall follows a slightly different orientation to the east wall of 1.16, space 1.15 is triangular in form. 17The 2011 excavation has also shown compartment 1.16 to be larger than expected (4.20 x 1.35 m) since its southern wall is not found on the same alignment as the southern wall of compartment 1.7 to the west but a considerable distance further south, in front of the rocky outcrop that delimits the lower terrace to the south. Even though its northern part has been completely washed away, 1.16 constitutes one of the better preserved structures and more carefully built structures in the cemetery (fig. 2.13). The walls (0.35-0.55 m thick) are constructed of medium-sized, roughly squared blocks and a doorway (0.55m wide) furnished with a threshold provided access between compartments 1.7 and 1.16. Even though compartments 1.7 and 1.16 share a common wall and communicate by means of a doorway, it is not certain that they were constructed at the same time. It is possible that 1.16 is a later addition that was constructed on top of an earlier fill. After the construction of 1.16, the east wall and the southeast corner of 1.16 were lined with a row of medium-sized blocks, which lies at a higher level than the external face of the eastern and southern walls of 1.16 and was perhaps intended to serve as a bench. The northern end of the west wall was also provided with a similar bench, save of course for the doorway which was left free. 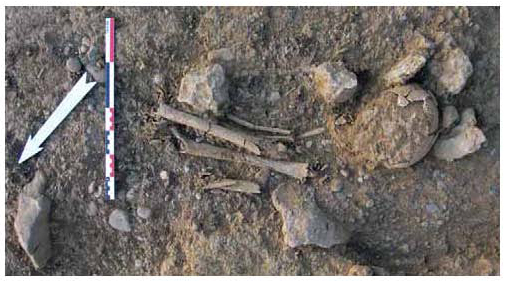 Compartment 1.16 is characterised by a lack of human and animal skeletal material. The pottery, although consisting of a fair number of complete shapes, appears to have been in a secondary depositional context. No clear floor level was identified. Although the walls were carefully constructed it is noteworthy that no stones that could have fallen from the walls were recovered and one wonders whether the upper part of the walls was originally constructed in mudbrick. 18The area between the rock outcrops that form the southern limit of the lower terrace and 1.16 (fig. 2.14) was used for the deposition of large amounts of tableware, presumably over different periods (EM III/MM IA and MM IIA). The overhanging bedrock seems to have been used for the storage of an extensive deposit of EM III/MM IA pottery, especially cups, jugs and juglets, bowls, dishes, trays and a single (empty and broken) larnax. Noteworthy is a small bowl with appliques of bovine figurines on the rim (fig. 2.17). Copious amounts of charcoal were also recovered throughout the deposit (fig. 2.16) in addition to some animal bone and obsidian blades. The charcoal had clearly been deposited inside the bowls and cups intentionally, but the latter do not show any traces of fire and had thus not been used as lamps. Most of the pottery is complete and seems to have been placed (or stored) here rather than dumped (fig. 2.15). There are no indications that this space was roofed over. The relationship between this EM III/MM IA deposit and compartment 1.16 to the north is not clear at present but it seems possible that space 1.30 was a larger, open space in EM III/MM IA, prior to the construction of 1.16, which appears to be a later addition to structure 1.7-1.8 (see supra). 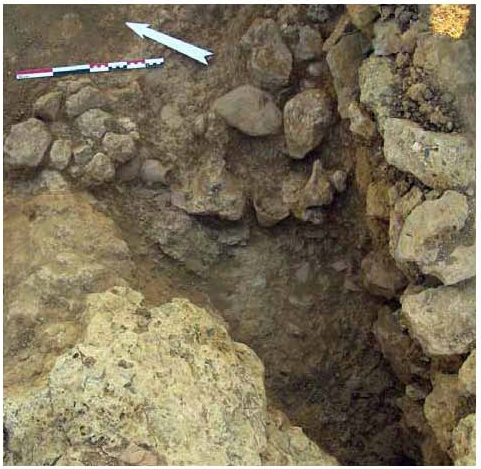 19There are almost no human bones in the EM III/MM IA deposit and the few that occurred were found mainly higher up and can be associated with the MM IIA deposition of large quantities of pottery and bones, human as well as animal (Sissi II: 59-61) placed over this area. It is clear that at the moment that this material was deposited, the walls of 1.16 were no longer standing. 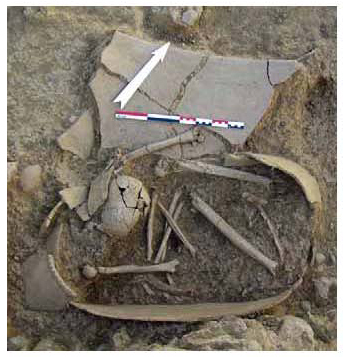 Significant quantities of small burnt bones were associated with this second episode of deposition as well as burnt mudbrick. There were also large amounts of human bone without traces cof burning and with a clear preponderance of long arm and leg bones. The preliminary study of the bones suggests a MNI of 16 adult individuals in 1.30 and 1.31. In addition, a lower molar and some phalanges of the hand and foot were also recovered. Small and short bones (carpals, phalanges, tarsals, spine etc.) are missing. 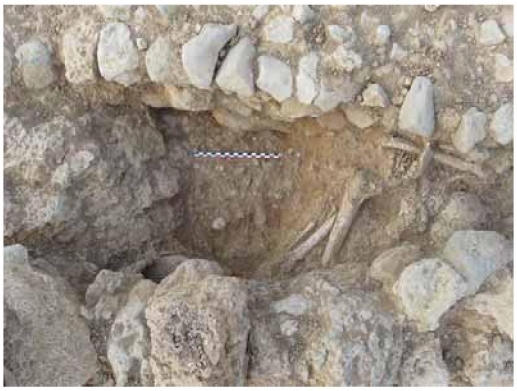 The most likely explanation is that this later deposition is related to the clearing out of (a) nearby tomb (s). The pottery and the long bones were reasonably well preserved and had clearly not been eroded down the hill or transported over a long distance. It is not entirely clear how the burnt bone should be explained but it is not impossible that the burnt mudbrick is somehow connected to it. 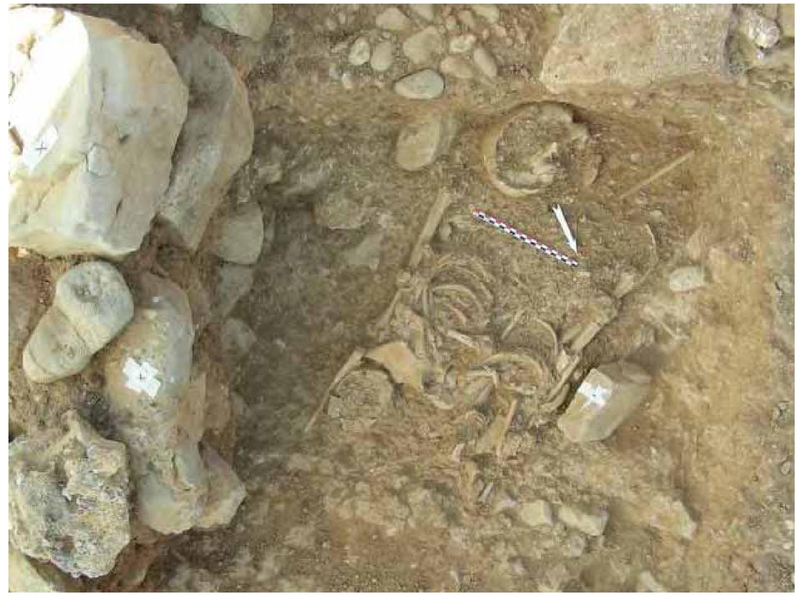 20The 2011 season also established that the cemetery extended further to the west than previously thought (fig. 2.1a & b). The lower terrace of the northern slope of the Sissi hill also seems to have comprised several small structures. 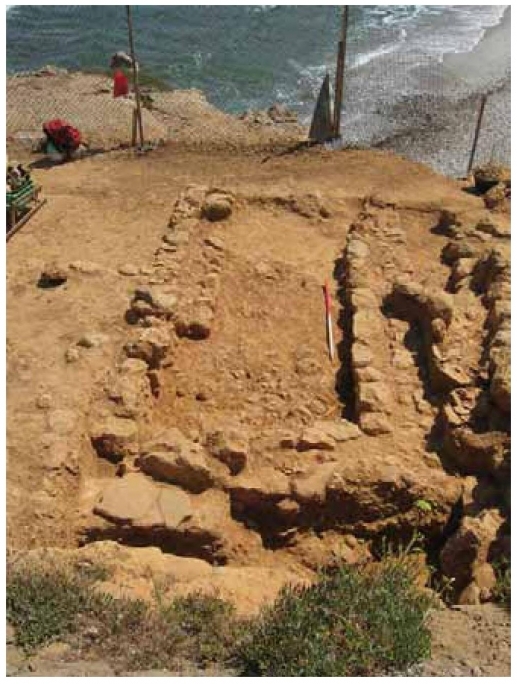 Excavation of a large structure that is perched on the edge of this terrace overlooking the sea was started in 2010 and continued in 2011 (Sissi II: 65-67). This tomb comprises at least 4 compartments of which only compartment 9.1 and 9.2 have been completely excavated. The structure was built on irregular bedrock so that the floor of compartment 9.1 is situated at a lower level than the floor in compartment 9.2. There are no obvious points of access to these two rooms. The tomb appears to have been constructed and used in MM IB/MM II. 21The tomb is delimited to the west, north and east by doubled-faced walls made of large-and medium-sized stones (ca. 0.45-0.50 m thick). Although the external walls are only preserved up to one course, the partition wall between Compartment 9.1 and 9.2 stands up to four courses thanks to the rising bedrock and a stone fill that provided protection against erosion. The southern wall of compartments 9.1-9.2, which was built at a higher level on the bedrock, is now completely eroded away save for a few small stones that remain in situ. Nevertheless, these small stones contrast with the larger blocks used for the outer walls of Building 9 and suggest that the southern wall may have actually been an internal division. A space (9.3) has been identified to the south but it is not entirely clear whether this was a closed compartment or an open space. At any rate, 9.3 was delimited to the south by a doublefaced wall, against which a platform or bench was constructed. This space was accessible from the southeast. To the east of 9.2, another compartment (9.4) was identified. It is not clear whether the eastern wall of 9.4 marks the eastern limit of this large tomb. This wall seems to have been cut by the construction of a small rectangular room (unexcavated) at a higher level with a slightly different orientation. 22Compartment 9.1 is a rectangular space measuring ca. 3.50 by 1.50 m. The 2010 excavation in compartment 9.1 yielded eight individuals. Of these, seven were primary burials and one was a secondary burial. 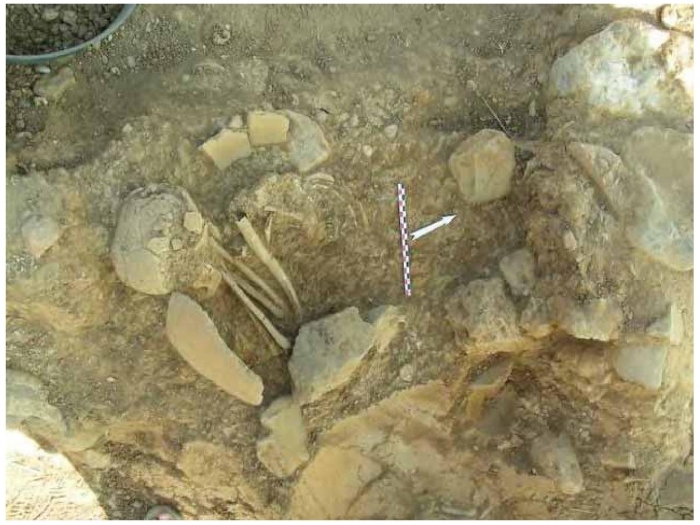 The 2011 excavation that went down to bedrock recovered in the lowest burial level three concentrations of bones of perinatals that were still partly in anatomical connection and thus primary depositions. 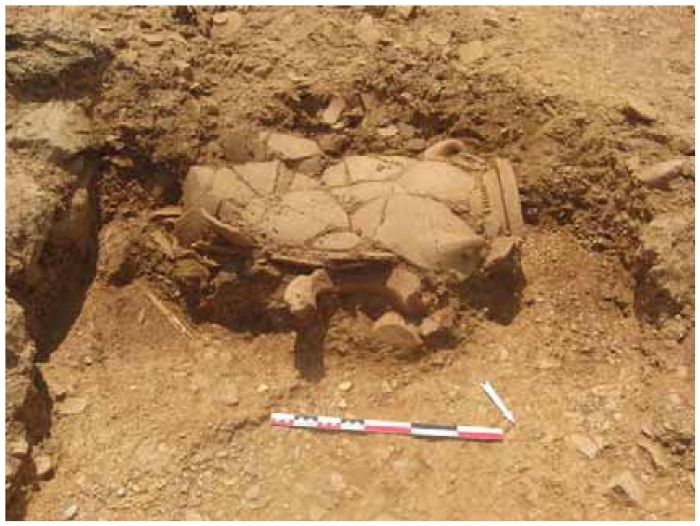 These had been placed on a levelling layer containing pebbles and small stones and can be associated with a deposit of three complete vases (2011-9-9848-OB001 and OB002; 2011-9-9856-OB001) (fig. 2.18). There are also a number of commingled human bones associated with this level. This earliest burial level was sealed off by a layer of sediment, above which a pithos containing individual 1 was installed together with the primary burials of individuals 4, 5 and 8 (Sissi II: 66). 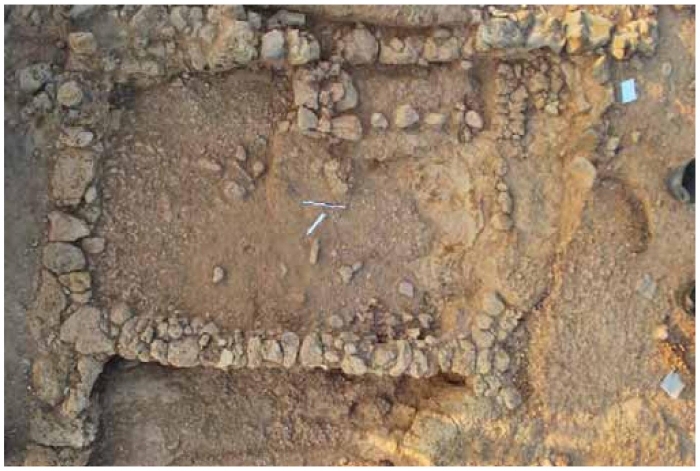 23Compartment 9.2 is situated to the east of 9.1 and measures 4.50 by 2.50 m. Three burial layers were identified containing a total MNI of 16 (fig. 2.19). 24The oldest level was a levelling layer, consisting of pebbles, stones and sherds, laid over the bedrock. 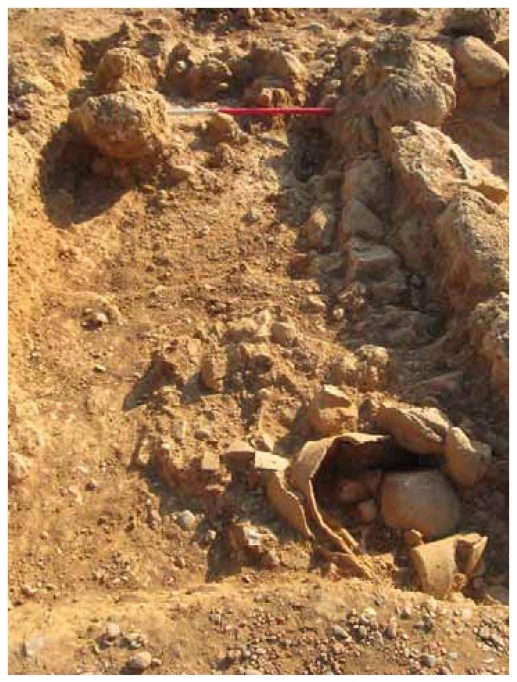 Against the eastern wall a pebble floor was installed over an area measuring 1 by 0.50 m, on which was placed a larnax containing the remains of one adult (no. 7, fig. 2.19). The body was lying on its back, with its legs drawn up and the head and knees probably resting against the sides of the larnax (fig. 2.20). Although the absence of small bones of the hand, feet and spine could be explained by bad preservation, the missing tibia bones cannot and clearly suggests that they have been removed after decomposition. In the north-east corner of the compartment to the north of the larnax and at the same level as the larnax three individuals were found (one adult, one child between 3, 5 and 6,5 years and a baby). The adult was placed over the infant on his/her front with legs drawn up to the thorax. Associated with this level and these burials was an inverted cup and an adult humerus (fig. 2.21). 25The oldest burial level (and the bottom of the larnax) was sealed by a layer of gravel on top of which a large fragment, broken off from the larnax (see supra), had been placed horizontally. Individual no. 2 (fig. 2.19) was placed on this larnax fragment on his/her back with arms folded across the upper body and legs drawn up to the thorax, a position which can only be explained by assuming that the legs were bound together or contained in a tight perishable container, such as for example, a piece of textile or a basket. This skeleton is not complete since the feet and the right-hand tibia and fibula are missing. The placement of the latter individual probably disturbed the left humerus of the individual buried in the larnax (fig. 2.22). 26The primary burials of three additional adults (nos. 3, 4 and 6, fig. 2.19) were found at this same level. The exact chronological relationship between them cannot be established because of the lack of stratigraphical interrelation. Individual 3 had been placed on his/her back, fore-arms crossed across the upper body with legs drawn up. This individual has undergone several disturbances after decomposition and the skull, mandible, right-hand ribs and humerus are missing. 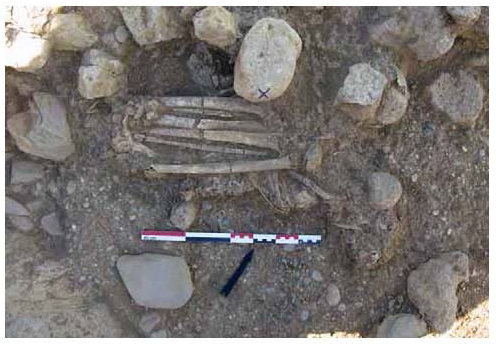 Individual 4 was placed along the west wall and is badly preserved; only the left femur, a pair of tibia bones and a fragment of humerus, ulna and fibula are preserved. These were not in anatomical connection and despite the fact that their fragmentary preservation could be due to erosion (since the bones were in a bad state of conservation) it cannot be excluded that we are dealing with a secondary burial. Individual 6 is represented by the skull, mandible, fragments of long bones, metacarpals, and was placed on his/her left side with the legs drawn up to such a degree as to suggest that they has been bound or contained in a perishable container. 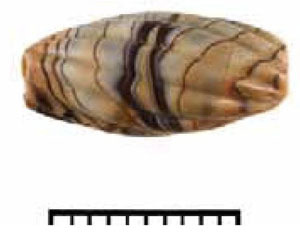 This burial is associated with a bead (fig. 2.26). In the southern part of the compartment, a pebble floor was laid and on it the remains of two adults (nr. 5 and 8, fig. 2.23) were found. Of individual 5, which was placed on his/her left side, the long bones, the left part of the coxal bone, the skull and some metacarpal bones are preserved. Individual 8 was placed along the west wall on his/her back, with the legs drawn up to the upper body (fig. 2.24). 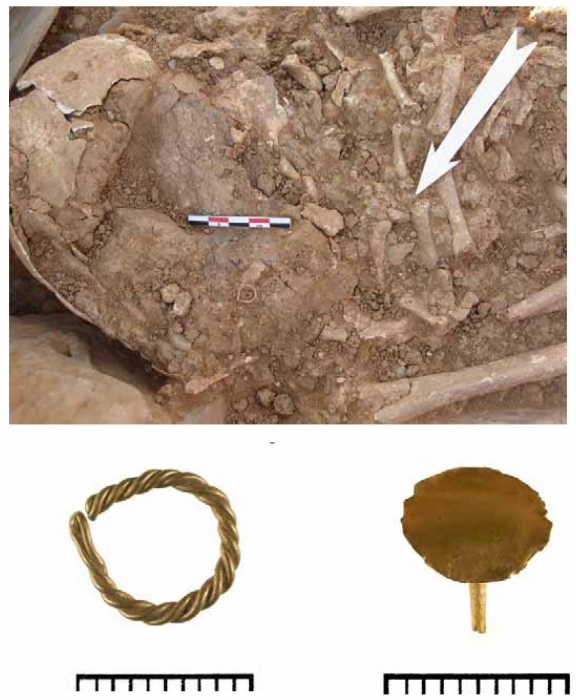 This burial is associated with a gold earring and gold ‘drawing pin’ (fig. 2.25). 27Post-dating these seven inhumations, which were covered by a layer of sediment, was the construction of a low wall that runs parallel to the east wall, thus forming a small compartment of 1.50 by 0.50 m. (fig. 2.19, fig. 2.27). 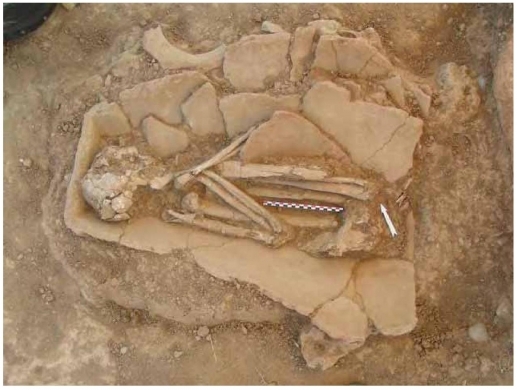 This compartment was found to contain the remains of at least five individuals (four babies and one adult) that were only partially preserved but presented evidence for anatomical connections. The last individual to be buried in this tomb was an adult male (no. 1, fig. 2.19). 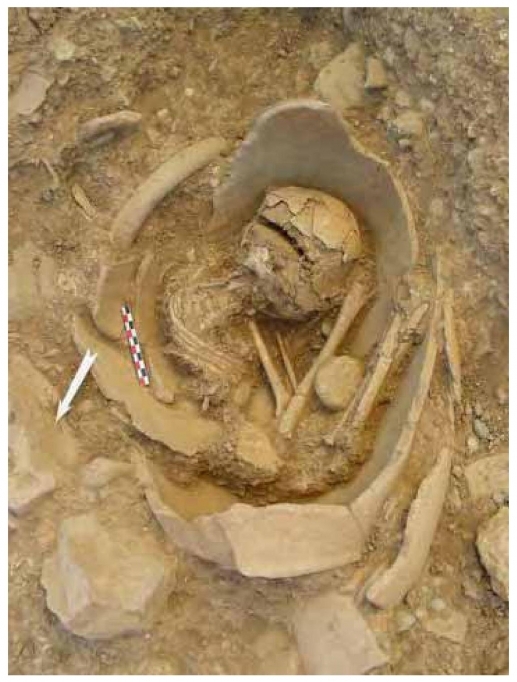 Although the skeleton was fairly complete, it is clear that some bones were disturbed and a detailed analysis is necessary to restitute the exact initial position of the body (fig. 2.28). 28Compartment 9.3 is situated to the south of 9.1 and 9.2 and measures 3 m by 2.50 m. As in the other compartments in this tomb the bedrock was found to have been leveled by a layer comprising fragmentary pottery and small stones. On this leveling layer some complete cups had been placed upside down (2011-9-9916-OB001; 2011-9-9917-OB001/003). Not a single bone was found in this compartment and it does not appear to have been used for burial. Along the southern wall of 9.3 was a low bench or platform. 4 Possibly calcite or limestone (whitish in colour). 7 For a similar motif but with straight sides, see CMS IV no. 10D b. 8 To these compare also somewhat the motifs on Dimopoulou 2000: 33 no. 11, 35 no. 22. 30A Middle Minoan soft stone signet (11-9-9906-OB001) with a convex seal face4 (fig. 2.30). The measurements of the seal are: seal faces: 1.70 cm; height: 1.70 cm; stringhole: 0.25 cm. The seal is only somewhat abraded, the edges of the stringhole are slightly rounded. It is engraved with hand tools and displays V-shaped intaglios, each created by the combination of two slanting cuts. On the seal face, the combination of four border segments creates a lozenge with concave sides5. Inside the lozenge is inscribed a smaller square and within this latter, a cross. Sets of parallels echo the sides of the square by extending from them outwards and thus filling the area between them and the lozenge. The shape of the seal is unusual as the combination of a concave conical (bell-shaped) body and a spherical grip is encountered for the first time. Concave conical bodies are met on some steatite MM II Petschafts whereas a spherical grip is encountered on an EM II-EM III cylinder seal with a grip6. The only piece that combines these two characteristics is the MM IA CMS V Suppl. 3 no. 476 whose grip is, however, not pierced. The motif of this seal does not find exact parallels among the existing seal corpus. The concave lozenge created by border segments is only paralleled on the rock crystal discoid CMS V Suppl. 1A no. 328 where a cross is inscribed in the shape7. A lozenge with straight sides, an inscribed cross and parallels filling the latter’s interstices is encountered on the chalcedony (?) discoid CMS V Suppl. No. 578. The shape of the piece combined with the convex seal face, the use of stone, and the motif date the seal to MM II. ▪ Dimopoulou 2000 = N. Dimopoulou, Seals and scarabs from the Minoan port settlement at Poros Katsambas, in I. Pini (ed. ), Minoisch-mykenische Glyptik. Stil, Ikonographie, Funktion. V. Internationales Siegel-Symposium Marburg, 23.-25. September 1999 (CMS Beiheft 6), Berlin, 2000, 27–38. ▪ Sissi II = J. Driessen et al. Excavations at Sissi, II. Preliminary Report on the 2009-2010 campaigns. AEGIS 4, (Presses Universitaires de Louvain), Louvain-la-Neuve (2011). ▪ Soles 1992 = J. Soles, The Prepalatial Cemeteries at Mochlos and Gournia and the House Tombs of Bronze Age Crete, (Hesperia suppl. 24), New Jersey (1992). 1 Participated in the 2011 campaign: N. Calliauw (KULeuven), S. Lozano Rubio (UMadrid), S. Geijsels (KULeuven), Ann Gilon (Université de Bordeaux), T. Devos (2011), Jeroen Vanhercke (KULeuven), Anneleen Rummens (KULeuven), S. Déderix (UCLouvain), C. Dalberra (Université de Bordeaux), P. Baulain (Paris IV-Sorbonne), Isabelle Crevecoeur (Université de Bordeaux), Aurore Schmitt (CNRS, Marseille), Aurore Lambert (Université de Aix-Marseille), Petra Verlinden (KULeuven), Katrien Devijver (KULeuven), Manolis Vrachnakis (2011), Ben Chan (Sheffield University), Ria Korpe (University of Thessaloniki). 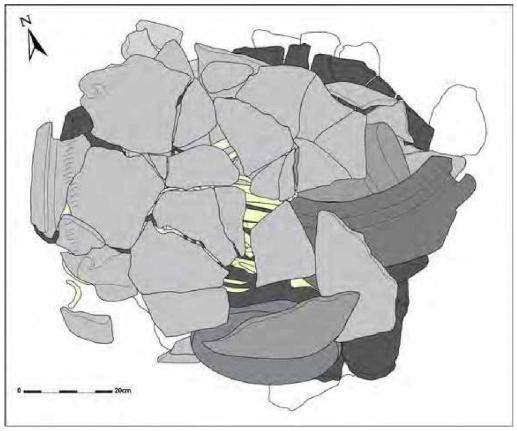 2 The secondary pottery deposit in 1.1 can be dated to MM II on the basis of fragments of a straight-sided cup in style écossais (Sissi I: 50-51). 3 The south wall of 1.17 was built at the same time as the east wall of 1.20. Space 1.20 is a small room filled with redeposited pottery (but no bones). Both 1.17 and 1.20 were constructed on top of the same floor of small sea-pebbles. 5 Border segments consist of a curved line and a set of parallel hatching placed vertically with regard to it such that a surface at the edge of the seal face is filled. For another example of a concave lozenge, see CMS II, 8 no. 1. For a triangle created by border segments, see CMS V Suppl. 1A no. 212. 6 MM II Petschafts: CMS VI no. 135; CMS X no. 44; CMS XI no. 289. EM II-EM III cylinder seal with a grip: CMS II, 1 no. 23. Jan Driessen, Charlotte Langohr, Quentin Letesson et al. SCHOEP, Ilse ; et al. 2. 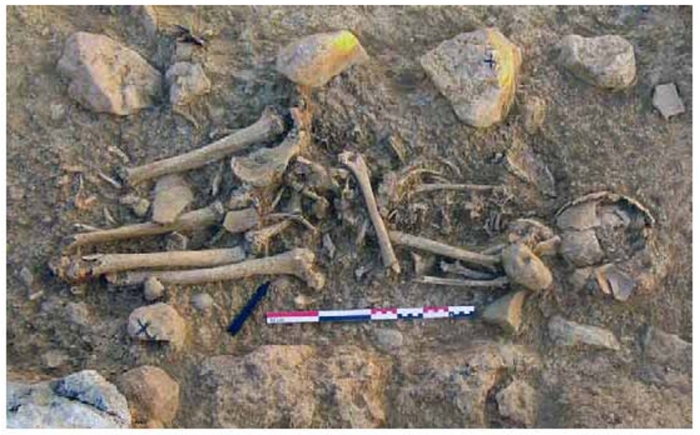 The Cemetery at Sissi : Report on the 2011 Campaign In : Excavations at Sissi III : Preliminary Report on the 2011 Campaign [en ligne]. Louvain-la-Neuve : Presses universitaires de Louvain, 2012 (généré le 26 avril 2019). Disponible sur Internet : <http://books.openedition.org/pucl/2895>. ISBN : 9782875585349. Schoep, Ilse, et al.. “2. The Cemetery at Sissi : Report on the 2011 Campaign”. Driessen, Jan, et al.. Excavations at Sissi III : Preliminary Report on the 2011 Campaign. Louvain-la-Neuve : Presses universitaires de Louvain, 2012. (pp. 27-51) Web. <http://books.openedition.org/pucl/2895>. DRIESSEN, Jan ; et al. 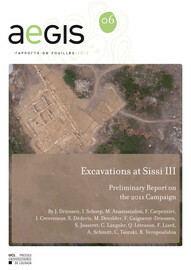 Excavations at Sissi III : Preliminary Report on the 2011 Campaign. Nouvelle édition [en ligne]. Louvain-la-Neuve : Presses universitaires de Louvain, 2012 (généré le 26 avril 2019). Disponible sur Internet : <http://books.openedition.org/pucl/2879>. ISBN : 9782875585349. 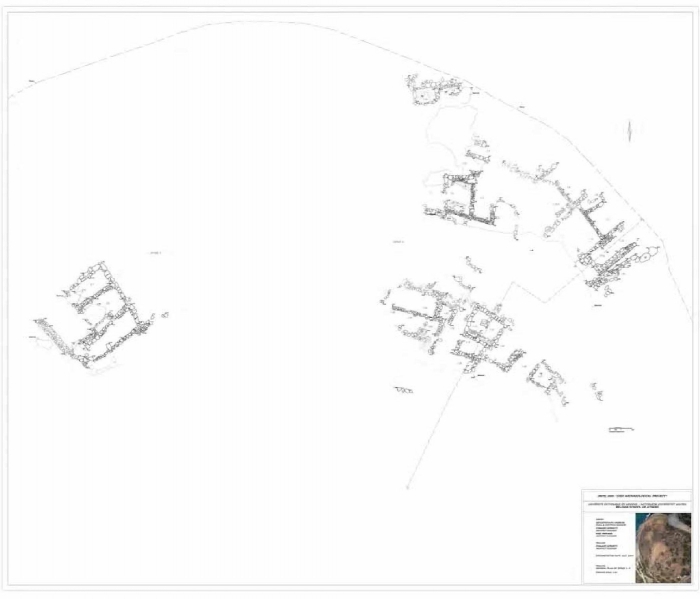 Driessen, Jan, et al.. Excavations at Sissi III : Preliminary Report on the 2011 Campaign. Louvain-la-Neuve : Presses universitaires de Louvain, 2012. Web. <http://books.openedition.org/pucl/2879>. Ilse Schoep, Aurore Schmitt, Isabelle Crevecoeur et al.